GLTC is pleased to be able to accept your personal check, Bank Debit card or major Credit Card for payment of bus passes and other services at our Transfer Center at 800 Kemper Street. We can only accept Credit or Debit card purchases of more than $10.00. Children under 45 inches always ride free, when traveling with a paying adult. Purchase on Bus, at Transfer Station or Main Office. Transfer Anywhere. Transfer Anytime. Unlimited use Until Midnight. Unlimited Use, Unlimited Transfers. Unlimited Everything for 14 Days. Functions just as a stored value card, deductions made per use until card is depleted. **Does not work on PTS. 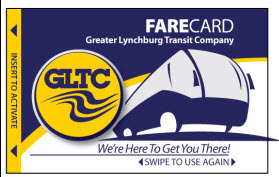 Full Fare: The fare paid by all riders who do not possess a GLTC half-fare card. Half Fare: Where applicable, riders who present a GLTC half fare ID card may ride paying the indicated half fare amount. To be eligible for a half fare ID card you must complete the application in the link below and meet one of the following criteria; 65 years of age or older, be a Medicare Card holder, or have a disability that makes you unable to use the bus service as effectively as persons who are not similarly disabled. Children: Those children under 42 inches (3 ½ feet – no taller than the Fare Box) may ride free when accompanied by a paying adult. No more than four (4) children per parent.